A revolution in ultra-compact device design, the Intel® NUC kit NUC5i5RYK packs a range of features, including the latest 5th generation Intel® Core™ i5 processor and Intel® HD Graphics 6000, into 4 inches square. This fully scalable Mini PC has the performance to drive home theater PCs, media server PCs, home hubs, and intelligent computing for small ...spaces. 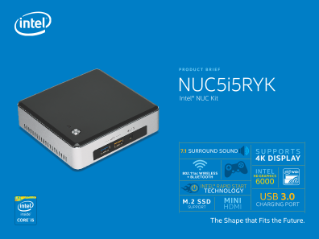 Whether you want a digital jukebox, home hub, or mainstream gaming PC, the Intel NUC kit NUC5i5RYK gives you the power to play, create, entertain, and inspire. The system is designed to hold a lightning fast and compact M.2 SSD so you can quickly stream music or movie files, and also features consumer infrared and a Mini HDMI* video interface. With Intel® WiDi you can connect your monitor without any additional cables and Bluetooth* lets you place wireless speakers wherever you want—all the features you want in a space-saving, clutter-free design. A replaceable lid gives you plenty of options to create the NUC you want—with amazing style and features. There is also a high-speed USB 3.0 charging port that lets you easily charge your tablet or smartphone quickly.